Fifty and Fabulous 50th Birthday Gift for Women Jewelry Fifty Birthday Bangle Bracelet Amazing Women (White) by LParkin at Resha Laser. MPN: 43235-111216. Hurry! Limited time offer. Offer valid only while supplies last. LParkin is committed to provide the good jewelry and the best customer services to our customers. Welcome to contact us if you have any questions. LParkin is committed to provide the good jewelry and the best customer services to our customers. Welcome to contact us if you have any questions. This bracelet will make an elegant and sentimental gift for your perfect family or friends. 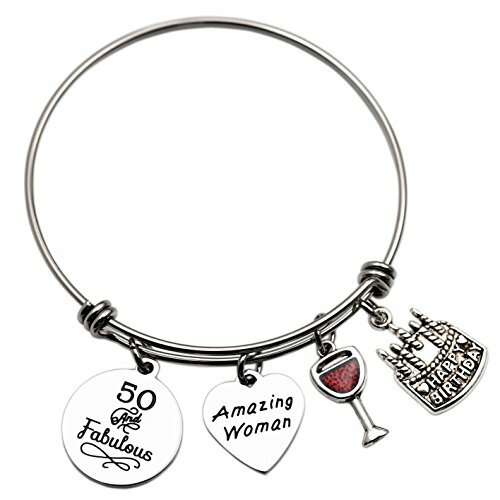 This best friends 50 and Fabulous Birthday Bracelet makes a great fifty gift for women. It's perfect for that special girl turning the big "50" and would be a special 50th birthday gift for a best friend or friends. The adjustable bangle bracelet is Stainless Steel - It won't rust or tarnish. The inner diameter is approximately 63 to 65mm. It is fully adjustable to fit approximately a 6 inch to 8 inch wrist. *will fit most adult and teen wrists. 50 and fabulous and Amazing women charms: Made of stainless steel. High quality polished finish; Other charms: made of alloy.